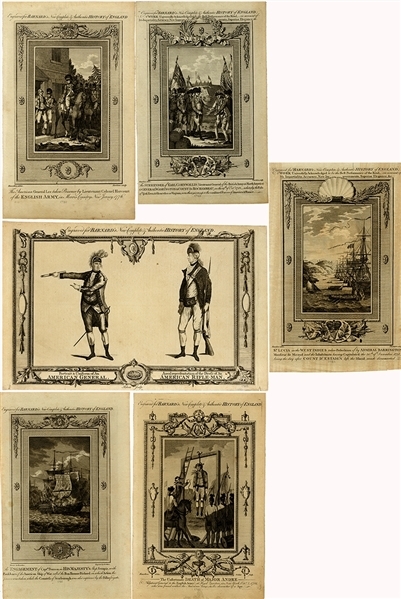 Six (6) engravings, 8-/4” x 14-1/4” all but one mounted on heavier board, and withdrawn from Barnard's New Complete & Authentic History of England (1782). The page titles include; “The American general Lee taken Prisoner by Lieutenant Colonel Harcourt of the English Army, in Morris Country, New Jersey, 1776. "; ... plus, "The Unfortunate Death of Major Andre (Adjudant General to the English Army) at Head Quarters in New York, Octr 2, 1780, who was found within the American Lines in the character of a Spy";... plus, "The SURRENDER of EARL CORNWALLIS (Lieutenant-General of the British Army in North America) to GENERAL WASHINGTON & COUNT DE ROCHAMBEAU, on the 19th of Oct. 1781_whereby the Post of Yorktown & Gloucester in Virginia, were then given up to the combined Forces of America & France." ; ... plus, "The Engagement of Captn. Pearson in His Majesty's Ship Serapis, with Paul Jones of the American Ship of War called the Bon Homme Richard: in which Action the former was taken, while the Countess of Scarborough was also captured by the Pallas frigate"; ... plus, "Portrait & Uniform of an American General, A real representation of the Dress of An American Rifle-Man," ... plus, "St. Lucia in the West Indies taken Possession of by Admiral Barrington..." HCA has sold a 1792 later edition of the Surrender of Cornwallis print alone for $770 (unmounted).